The Davis Library basement will close on Oct. 30, 2018, for work related to the ongoing infrastructure project in the library. Microforms and government documents housed in the basement will be available with a one-day delay. To request these items, visit the Library’s Carolina BLU delivery service page and specify the materials you would like us to retrieve. Non-affiliated users, please use this form instead. For questions about library operations, services and materials during the project, contact Joe Williams at joewilliams@unc.edu or (919) 962-1301. You can also submit a comment or question online. For questions about project scope and management, contact UNC Facilities Services. 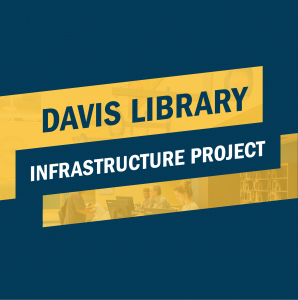 The Davis Library Infrastructure Project is scheduled to conclude in early 2019.